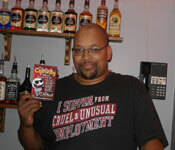 Our very own Instructor Milton Wyley is competing in the Comedy Festival Stand Up Show. He will be competing against 36 other qualifiers. Visit clevelandcomedyfestival.com for more details.